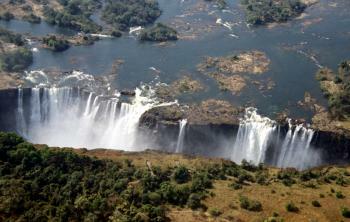 The Mosi-oa-Tunya/Victoria Falls in the Zambezi River is the largest waterfall in the world. The combination of its height (108m) and width (1,708m) results in the world's greatest sheet of falling water. This transboundary site is located in 3 national parks: the Mosi-oa-Tunya National Park (Zambia), Victoria Falls National Park (Zimbabwe) and Zambezi National Park (Zimbabwe). The Zambezi River system comprises eight gorges. There are several islands that attract migratory bird species, making it an Important Bird Area. Mammals including elephants, buffalo, giraffe and hippopotamus can also be seen. I just did the Falls in September and love it. I actually found that although the best views are on the Zimbabwe side, the Zambia side has some spectacular views as well. Plus the hike is more intense and much better. Seeing the Falls from the bottom and spotting Devil's Pool from the Zimbabwe side is also good to see. Read more from Kerwin here. It is a bit surprising to discover that, as of May 2005, Mosi-oa-Tunya/Victoria Falls have still not been reviewed – so I will “put that right”! One reason possibly is that the site is self evidently “world class” and needs no introduction or explanation. I still debate with myself whether or not it surpasses Iguassu and generally conclude that the latter offers a fuller “visiting experience” with generally more to see over a longer time with more “surprises” and with more associated interest of flora and fauna. But as a “waterfall” per se Victoria Falls is “right up there” as a full-on experience however much the Zimbawean government makes life difficult for tourists. Both of our visits took place before the recent collapse of the Zimbabwian economy, currency and socio-political framework and some of our experiences may not now be achievable or relevant. We travelled around Zimbabwe “self drive” with petrol easy to obtain. We stopped off in Hwange park on the way from Bulawayo (excellent road at that time) and already found that to be a disappointment in comparison with other African wildlife parks. Time and poaching are not likely to have improved matters! The town of Victoria Falls was totally atypical of others in Zimbabwe – a tourist ghetto offering all sorts of “non African” thrills and experiences – bungee jumping, white water rafting etc etc. It is what I term a “blow-out” town - the sort of place one needs to visit occasionally to unwind and relax after periods of tough travelling. The main point I would make about Vic Falls is to recommend visiting them from all 3 sides – ie the Zimbabwean, the Zambian AND from the air (see photo). No doubt some would add a 4th – from river level white water rafting but, since this takes place quite a way downstream of the falls I wonder how much you actually feel to be “under the falls”. By the time of our second visit Zimbabwe had introduced “single visit tickets” which meant that you could not enter on the same ticket both morning and afternoon. This is unfortunate since the sun provides very different views at different times of day but the price of a ticket militates against paying twice! We booked our helicopter ride early in the morning on arrival from Hwange, saw the falls am, flew around lunchtime (the helipad is a few miles outside town and really needs a car to get to), crossed over to Zambia for early afternoon, returned for “English Tea” at the Vic Falls hotel at 4 pm (an essential part of a “blow-out day”) and then drove back to Bulawayo in the dark (not entirely to be recommended because of unlit cattle and elephants on the road!) . All in all memorable day. We just hope that 1 day the people of Zimbabwe will get a government capable of ruling with justice and efficiency and that we may return. Notable Bridges: The Victoria Falls Bridge is a steel bridge from 1905, built over the Second Gorge of the falls. It is on the border between Zimbabwe and Zambia. Visual effects of Cloud, Fog and Mist: crit vii "resulting from the spray plume of about 500 m (at maximum height) that can be seen from a distance"
Queen Victoria: Inscribed in 1989 as Victoria Falls/Mosi-oa-Tunya. Named after Queen Victoria by David Livingstone during his 1852-6 journey from the Upper Zambezi to its mouth. 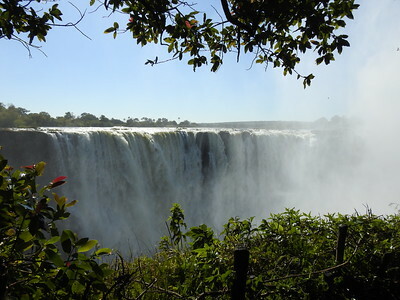 As of Oct 2009 the park in Zimbabwe within which the falls are isutated is still called "Victoria Falls NP" altohugh the equivalent park on the Zambian side is called "Mosi-oa-Tunya NP". Cecil John Rhodes: The Railway bridge was the brainchild of Cecil Rhodes, part of his grand and unfulfilled Cape to Cairo railway scheme, even though he never visited the falls and died before construction of the bridge began. Rhodes is recorded as instructing the engineers to "build the bridge across the Zambezi where the trains, as they pass, will catch the spray of the Falls"
Name changes: A reseqencing of a bilingual name - "Mosi-oa-tunya/Victoria Falls" was "Victoria Falls/Mosi-oa-Tunya" in the documentation and WHC minutes of 1989. 139 Community Members have visited.